Fine Arts Center Grand Opening! 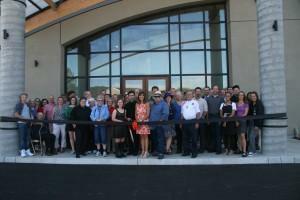 » Fine Arts Center Grand Opening! Fine Arts Center Grand Opening! In celebration of the opening of the new Fine Arts Center at Arcata High School, The Northern Humboldt Union High School District (NHUHSD) held a Ribbon Cutting Ceremony on June 3, 2016. The event was extremely well attended and included refreshments, student led tours, art exhibitions, and concluded with the Spring Concert featuring performances by the Arcata High School Choir, Madrigal Choir, the ArMack Jazz Band, and ArMack Orchestra; all under the direction of music teacher, Cassandra Moulton. Photo: Student Talia Mueller and NHUHSD Board of Trustee President Colleen Toste cut the ribbon surrounded by staff, builders, and community members.